Hat Creek Ranch is one of our most popular ranch destinations! This secluded, intimate hideaway is sure to please everyone in the family, from hard-core anglers to those just dreaming about a quiet, relaxing getaway. Guests enjoy a half mile of exclusive access on Upper Hat Creek, three trophy trout ponds, and one of two cozy streamside vacation cabins. This is meadow fishing with undercut banks and willows that offer just enough cover to keep the fish happy, but not so overgrown that an angler can’t present a fly to one of the numerous trout that rise consistently throughout the day. PMD, BWO, Caddis, Stoneflies, Midges, Hoppers and other assorted Terrestrials and even streamer patterns, all have their time and place during the many seasons of Hat Creek. The ranch is about an hour east of Redding and a short hop from the town of Burney. This portion of Hat Creek is noted for the vibrancy of its aquatic life. 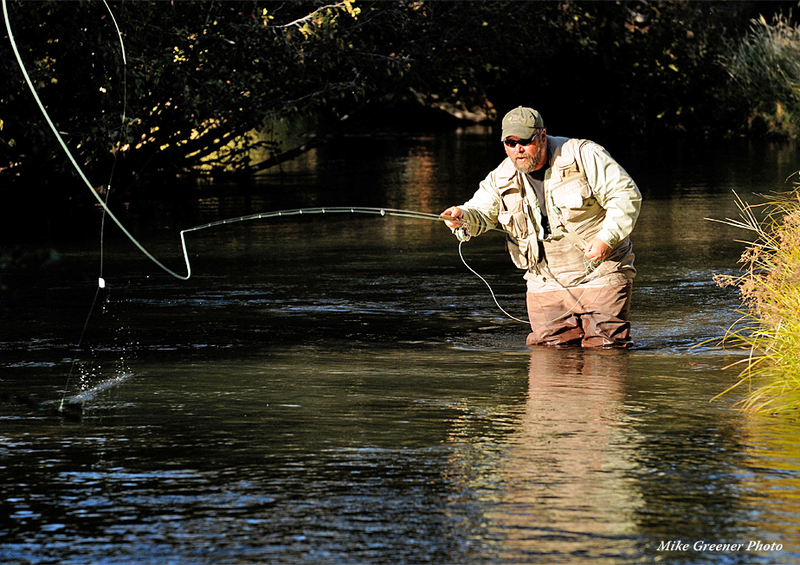 Top water action is prevalent every day of the season, and opportunities abound for nymph and streamer fishing as well. There are fish of all sizes in this stretch of river, and patient anglers, who take the time to stalk their quarry and make a good presentation, can sight-cast to some real bruisers. In addition to the great fishing on the ranch waters, the Hat Creek Ranch cabin makes for a great home-base to access many of Northern California’s premier public waters, including the Wild Trout Section of Hat Creek, the Pit River, Fall River, and McCloud River, as well as smaller streams like Burney Creek and stillwaters such as Baum Lake. Visiting fishermen will be delighted with either the Blue Cabin (two story, two bedroom, one bath home) or the Old Ranch House (three bedroom, two bath historic homestead), both situated right on the banks of the stream. Both homes have fully equipped kitchens, comfortable front rooms, and outside barbeques. You can have your pick of either home when reserving time at this ranch, or both cabins can be made available for larger groups. Included in your lodge package at Hat Creek Ranch is cabin access, use of cabin supplies, and the fishing beats that go with your cabin. For non-anglers, there are some wonderful activities in the area besides fishing, including great nature hikes and nearby waterfalls in both state and national parks. 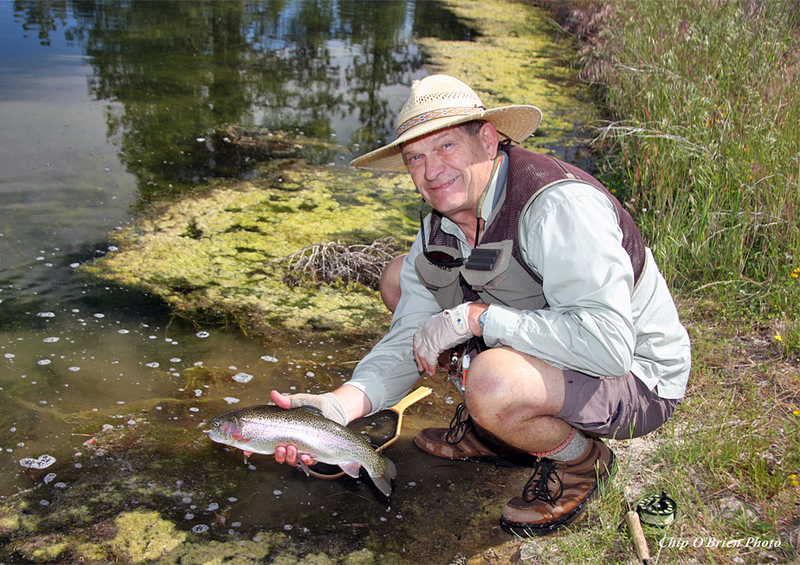 Hat Creek Ranch is a perfect location for a family fishing holiday. 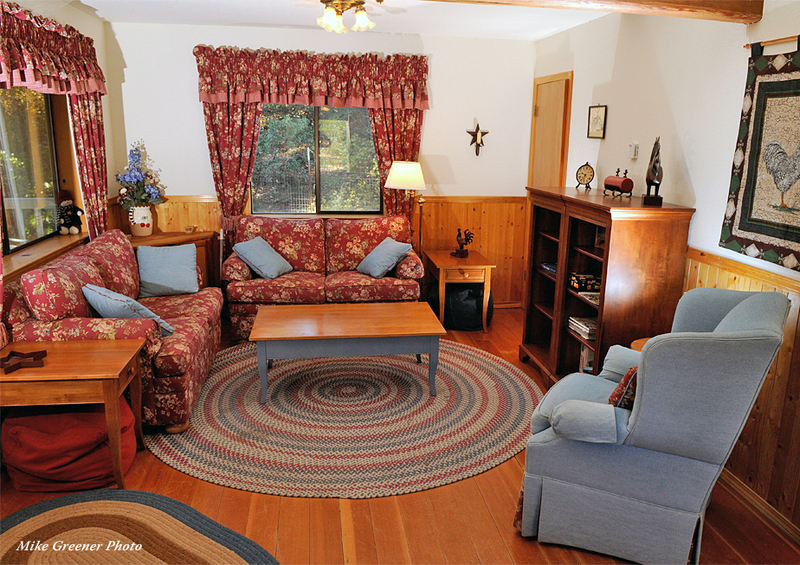 Guests may choose to stay at the cozy ranch house situated on one of the most exclusive sections of Upper Hat Creek, or simply enjoy daily fee access to the trophy trout ponds and half mile private meadow stream. Hat Creek is not an unfamiliar name in the world of fly fishing. It is one of the best known spring creek fisheries in the West. The only fishing on the ranch for these months are the two ranch ponds with their trophy sized trout. Many of these early spring days can be quite nice, and offer anglers a chance to sooth that fishing itch for some quality trout at an easily accessible site. Midges are the food source at this time of year so come prepared to fish tiny flies on light tippet. The ranch ponds are small and can be easily fished from the shore without the need for float tubes. It is difficult to predict what kind of angling and weather to expect during late spring. Some years there are good hatches of several different types of insects in full swing by the end of April and the weather will be quite decent. In other years winter just doesn't seem to want to let go: water flows can be high, off color and very cold and the weather isn't the best. Few hatches can be seen for the most part, although one can always hook fish on streamers and nymphs. The fish will always be hungry this time of year, so catching can be good even when there aren't many bugs hatching. You can get away with heavier tippets to really lean into the bigger fish to head them away from in-stream structure. Of course, Midges will be hatching on the ponds and the Stoneflies will be stirring in the stream, beginning their annual migration towards the banks for their early summer emergence. Normally, we will know what type of late spring to expect sometime in April, so you will have a little advanced notice as to what to expect, which should help in making reservations. Every bug in the watershed will be making their presence known in summer. You will have the opportunity to toss big dries and nymphs and also the smaller mayflies and caddis flies. Topping all that off will be the chance to fish all the terrestrials you like, both in the stream and in the ponds. The big bugs come out starting in June with the Salmonflies, golden stoneflies, and even a few Green Drakes. Mixed in there are always healthy hatches of yellow sallies, PMDs, and caddis. On the ponds, the first of the many Callibaetis mayflies begin to hatch, creating exciting sight-casting opportunities to cruising rainbows slurping emerging or spent callibaetis off the surface. Midsummer is the time for terrestrials and tricos. Hoppers, beetles, and ants are all blown into the creek on a regular basis, and trico mayflies hatch almost every morning. Callibaetis continue to emerge on the ponds, with damselflies joining them in the middle of the day. The weather will be warm during the day, but the nights will be cool thanks to the ranch's 3200 foot elevation. As always Midges will be a factor in the ponds. What a time of year! As fall starts to arrive the nights will be decidedly colder, the early mornings frosty and late evenings down right cool, if not cold. Fishing is best late morning to late afternoon, all of which means you can sleep in just a bit more and start those steaks sizzling on the barbeque earlier. Terrestrials will work right on in to October and as the days get shorter and shorter the streamer action will pick up. The dry fly with dropper technique will work well, midges will produce, and lastly there is a hatch of October Caddis on Hat Creek to finish off the season. The Fall colors in this area are spectacular and worth time just to enjoy. Hat Creek Ranch sits on the dry side of the mountain range to the west of Redding. It is not unusual to have sunny pleasant days throughout the winter months in this area. Hat Creek Ranch is very close to Baum Lake, a very well known winter fishery. The 3 ponds and the fisherman's house will be available all winter at a discounted off-season rate. We ask that incoming guests not enter the ranch until 3:30 P.M. As with all of our private ranches we try to stress that all guest adhere to the schedule for their particular reservation. No one wants to be just finishing up their stay at a ranch and have the incoming clients arrive early. Of course, if the leaving guests over stay their departing time the overlapping of groups may not be avoidable. Please follow the time schedule - it makes everyone's trip more enjoyable. You will be provided with a very complete information packet of the ranch, with directions to the ranch, simple regulations, a map of the stream and location of both ponds, tips for using the house and fishing suggestions. Non fishing guests have the run of the ranch roads. Please drive slowly to keep down the dust. We ask that you avoid hiking off the ranch property onto the neighboring ranches. Hat Creek Ranch has fences at both the north and south ends of the property. The west boundary lies next to a very extensive wilderness area. It is not illegal to hike in it, but you should not be inexperienced in dealing with wilderness areas. Hat Creek Ranch is located close to a number of site seeing destinations that the non-anglers in your group can take advantage of. Just 5 minutes away is the Radio Astronomy Observatory (public welcome), and some 40 minutes to the south is Lassen National Park and 15 minutes to the west is Burney Falls State Park. Both have tons of hiking trails and are well worth the effort to visit. The owner of Hat Creek Ranch has put a lot of effort in clearing away streamside willows to make your fishing more enjoyable. Plus he has been working on creating more in-stream habitat. The idea is to make the fishing more enjoyable, but not destroy the naturalness of this beautiful stream. The housekeeper will arrive to start cleaning the cabins at 1:00 PM, so we ask you to be out of the cabins by then. You are more than welcome to fish until 3:00 PM and then it is your time to depart and soon after a new group most likely will be arriving. In a perfect world you will pass each other on the road somewhere and all will be well. We will inform you if another group is not leaving when you arrive or depart, and if such is the case you will be able to relax a bit on the arrival and departure times. 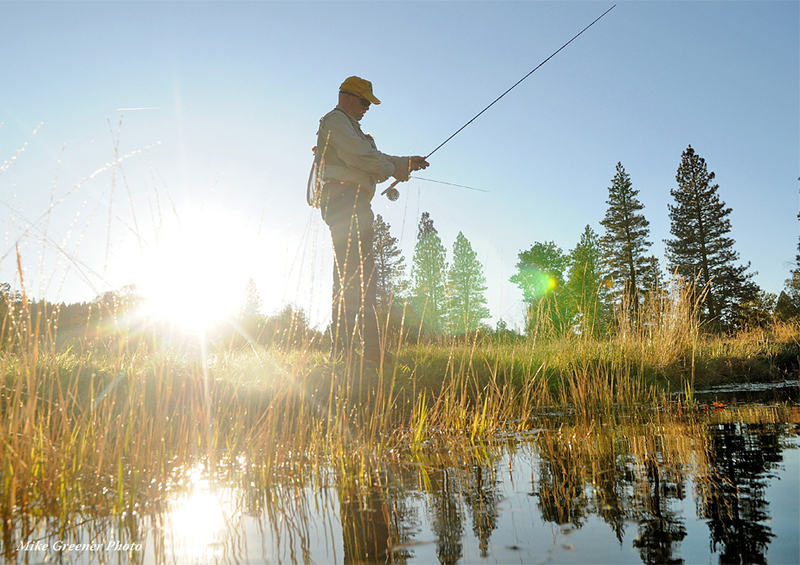 Hat Creek Ranch is located east of Redding, taking approximately 1 hour from The Fly Shop®. Take the Hwy 299E exit off of I-5 at the north end of Redding and travel to Burney. Travel time is approximately 1 hour. Continue through Burney and go 5 miles to the intersection of Hwy 299E and Hwy 89. There is a blinking light at this intersection. Turn right (east) onto Hwy 89 and proceed 7.5 miles. At mile 7 start looking to your left. You will be passing by a brushy area will a low lava ridge just to the east. You will soon see a sign marking the entrance to the Hat Creek Ranch. Turn east (left) on the gravel driveway and proceed approximately 300 hundred yards up over the lava ridge and down in to the ranch. Park in front of the blue two story home to the left, just before the creek. If you go too far on Hwy 89 you will come to the Maahcooatche Store (which is closed). Turn around go back 1/2 mile to the ranch entrance. (19005 Hwy 89). Take Hwy 44 out of the middle of Redding and travel east through Shingletown and on to the community of Old Station. Travel time to Old Station is approximately 75 minutes. Take Hwy 89 north to the Community of Hat Creek (about 9 miles). Fireside Village with its restaurant and gas station marks the north edge of the community. Another mile on Hwy 89 will bring you to the Maahcooatche Store (it's closed), and the north edge of the community. Proceed another ½ mile north on Hwy 89 and look for the sign, the Hat Creek Ranch. It will be on the east (your right) side of the Hwy. Take Hwy 299E west to the blinking red light at the intersection of Hwy 299E and Hwy 89. Travel time to this point is 15 minutes. Now follow the directions shown above when traveling from Redding on Hwy 299E.